That's how long it took before Marcus Smart launched himself on the floor in Game 5 of an Eastern Conference first-round series against the Milwaukee Bucks last year. Smart was playing his first game in six weeks after tearing a ligament in his right hand but, with little more than a protective wrap, he dove on the hard parquet in pursuit of a loose ball. It's the perfect summation of Smart. And it's exactly what the Celtics will miss after an MRI on Wednesday revealed that Smart will be out four to six weeks with what the team termed a partial avulsion of his left oblique abdominal muscle off of his iliac crest. It's an injury that's rare to NBA players, according to sources, which makes the return-to-action timeline a bit murkier. The Celtics were holding out hope that Smart might recover in time for a return in Round 2 of the postseason, according to league sources, but even a four-week recovery would leave him returning to basketball activities in early May. The conference finals are scheduled to start May 14-15. Much will be made about losing Smart's defensive tenacity and there is no denying his impact on that side of the ball. Smart sets the tone on the perimeter, particularly while starting alongside the more offensive-minded Kyrie Irving, and could defend a variety of wing positions. The bigger loss, from this vantage point, is what Smart gives the Celtics in hustle and intensity. Boston can slide Jaylen Brown or Gordon Hayward into a starting role and get plus-defense, but who is the player that will dive on the floor for that game-changing 50/50 ball in the waning seconds of a tight game? The Celtics built a deep roster in order to weather these types of storms. Smart's absence doesn't just increase minutes for Hayward and Brown, it creates an opportunity for Terry Rozier, who can play both guard positions. Rozier shined while starting in place of Irving in last year's playoff run. It would seem the spotlight will fall brightest on Brown, who started the season as the team's starting 2-guard before Boston's early-season starting five fizzled. Smart elevated to that starting spot on Nov. 23 and never relinquished it. But Brown brushed off a slow start and played some inspired ball since the calendar flipped to 2019. According to the NBA's tracking database, Brown held opponents a field-goal percentage that was minus-3.4 percent below their typical season average - an excellent number. Some of that is a product of playing against reserve lineups and the challenges will be greater in the postseason but Brown has the defensive ability when he's focused. Boston has played its best basketball when its defense is engaged and that puts an even greater burden of the likes of Al Horford and Aron Baynes as the second line of defense. Everybody has to be a little better on defense to make up for Smart's absence. Still, the big question is who steps up and makes the sort of plays that made Smart synonymous with a "winning plays" hashtag. 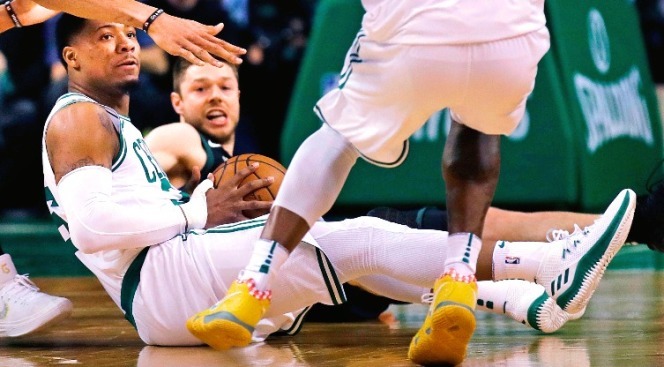 The Celtics need to put a premium on hustle and effort - everything that Smart oozed each time he was on the floor, routinely putting the team before his own health.